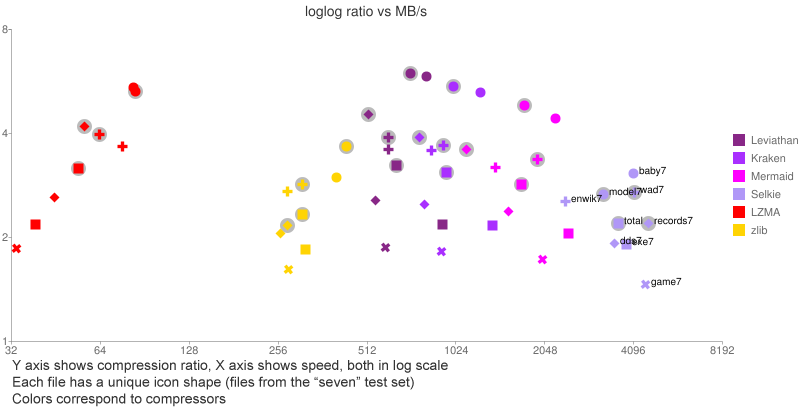 Leviathan is a new lossless generic data compressor which gets very high compression ratios while still being fast to decode. 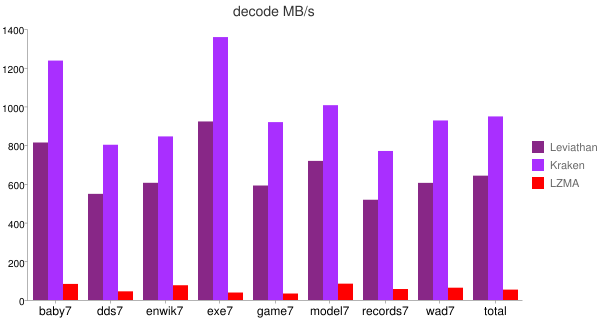 Leviathan smashes the previous record for how fast a high ratio codec can decompress! Leviathan joins the amazing Oodle Kraken and Oodle Mermaid and Selkie which set a new standard for super fast decompression with good compression ratios. 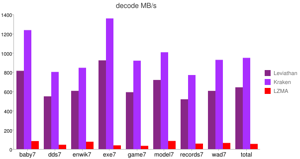 Oodle is a library of unique data compression algorithms that offer world-beating performance at a variety of compression ratios. Make your game smaller to download, make your levels load faster, and save money on bandwidth! Before Leviathan, if you needed more compression than Oodle Kraken, you had to take a huge step down in performance. To get slightly smaller than Kraken, you could have used 7z/LZMA, but at the cost of decoding 20× slower! Data compression is always a trade-off of speed vs ratio, to get smaller files you must pay a price in decode time, but the price was far too high. There had to be a better way. Enter Leviathan. 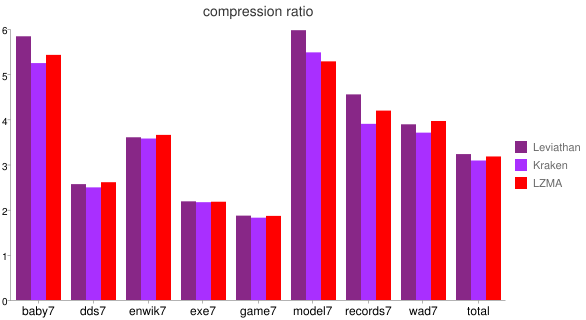 Leviathan makes high compression possible where it wasn't before. Leviathan allows you to reach high compression ratios with only a 33% decode speed reduction vs the blazing fast Oodle Kraken - meaning it's still 2-3× faster than zlib. 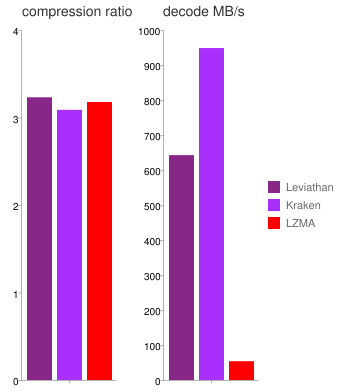 Leviathan achieves a continuous tradeoff of speed for compression ratio in the family of Kraken, Mermaid and Selkie. Leviathan provides high compression and fast decode speed without compromise. Its performance is consistently great across a wide range of data types. Leviathan makes high compression practical on mobile devices, game consoles, and other systems where slow decompression is ruled out. It runs great on every platform, with careful optimizations for each. Leviathan is ideal for packing data compactly for distribution, but it doesn't need to be unpacked for an install - it's fast enough to load directly into your application. The Leviathan encoder considers many options for how to form the best possible compressed data. It measures the space-speed value of every decision, allowing it to find ways to compact the bitstream without sacrificing decode speed. Because of this the Leviathan encoder is not intended for realtime use; Leviathan is best for scenarios like distribution. Oodle's Kraken, Mermaid and Selkie are excellent alternatives when fast runtime encoding is needed. Of course with Oodle you also get the amazing Oodle Kraken as well as Mermaid and Selkie, which offer higher speeds than Leviathan. Leviathan, Kraken, Mermaid and Selkie are part of a new family of compressors that achieve a better balance of compression ratio vs. decode speed than anything that came before. With Oodle, you can easily choose the compressor that fits your needs. Each Oodle compressor achieves the best possible space-speed tradeoff in its respective domain. Oodle offers a family of data compressors with different performance tradeoffs, so you can choose the one that works best for your needs. Oodle runs on every game platform, and the data is the same on every platform - compress your data once and be done with it. Oodle comes with a simple C API that is separable, light weight and easy to integrate. Oodle also has a unique network packet compressor. See everything Oodle has to offer! Oodle is easy to use, cross platform, and super fast. Don't take our word for it, email us for a free evaluation SDK.